The Marines were escorted the entire route of their Fight-Out by close-support aircraft from their magnificent 1st Marine Air Wing. That's the way Marines were trained. An F4U Corsair can just be seen in the middle of the column of smoke, checking the effectiveness of his attack. Following WWII, Generals Marshall and Bradley, and the Joint Chiefs of Staff, wanted to unify our armed forces. Basically, that would have eliminated the role of the USMC, and disbanded the Marine Air Squadrons. 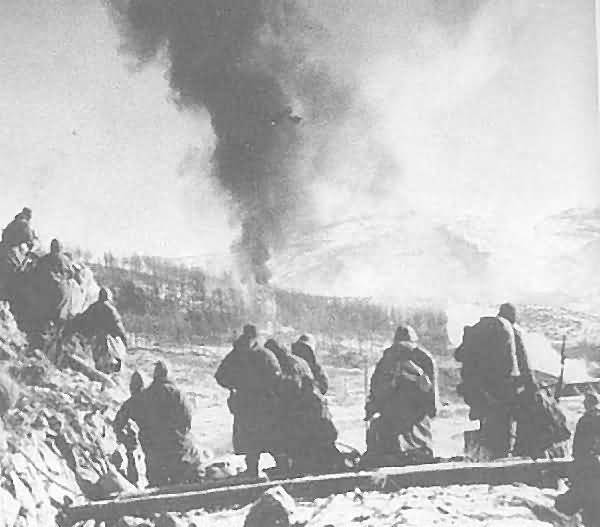 Had they had their way, without even the First Marine Brigade, many believe Pusan would have been lost, and South Korea would have been crushed. In fact, the Truman administration almost accomplished that, reducing the Corps to 6 fighting battalions armed with worn-out WWII equipment. But, as the Chinese foot infantry were proving to Eighth Army, battles are not won by opinions. In the final analysis, they are won by fighting men and China's Armies were fighting men. The Marine Infantry were fighting men as well, and they had brought their fighting F4-U Squadrons with them.